Habit: Annual, perennial herb, subshrub, canescent to stellate-hairy, with longer hairs or not. Leaf: petioled; blade lance-linear to triangular, entire to deeply dissected. Inflorescence: raceme-like (flowers clustered in bract axils) or panicle; bractlets (0)1--3, inconspicuous, generally deciduous, thread-like. Flower: petals obovate, white, lavender, pink, rose-pink, salmon- or red-orange, or apricot; filament tube hairs 0 or stellate, anthers generally +- yellow or +- purple; stigmas head-like. Fruit: segments 9--17, 1--2-seeded, below indehiscent, strongly net-veined, above dehiscent, smooth. Seed: gray, black, or brown. Species In Genus: +- 50 species: arid America. Etymology: (Greek: globe mallow, from fruit shape) Note: Polyploidy, intermediates common. Habit: Subshrub, canescent. Stem: erect, generally 0.5--1.5 m. Leaf: blade 15--48 mm, +- lance-linear, 3--5-veined, light gray-green, entire to wavy-crenate, base tapered; lobes 0 or leaf hastate. Inflorescence: raceme-like, tip generally with leaf-like bracts; flower stalk +- = calyx; bractlets thread-like. Flower: petals 7--9 mm, red-orange; filament tube 5.5--7 mm, hairy, anthers yellow. Fruit: segments 9--13, 4--7 mm, 1.5--2 mm wide, truncate-conic, dehiscent part 3--4 mm, +- 75% of segment. Seed: 2 per segment, brown-black, hairy. Chromosomes: 2n=10,20,30. Ecology: Desert scrub; Elevation: -6--500 m. Bioregional Distribution: DMoj, n DSon; Distribution Outside California: to Kansas, Texas, northern Mexico. Flowering Time: Mar--Oct Note: Relationship to Sphaeralcea emoryi needs study. 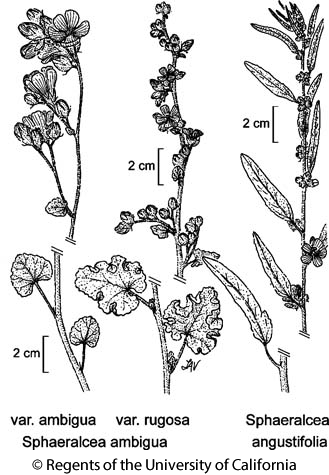 Citation for this treatment: John C. La Duke 2012, Sphaeralcea angustifolia, in Jepson Flora Project (eds.) Jepson eFlora, http://ucjeps.berkeley.edu/eflora/eflora_display.php?tid=45131, accessed on April 24, 2019.